Christmas Trees ARE SOLD OUT!!!!!!!!!!!!!!! Thanks to everyone for your support!! Happy New Year Conestoga Rugby Family! What does Conestoga Rugby do with your $185 payment? 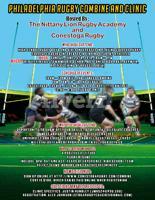 The Nittany Lion Rugby Academy and Conestoga Rugby are holding a combine on June 24, 2018 from 10:00 AM - 4:00 PM at the Tredyffrin Eastown Middle School located at 801 Conestoga Road, Berwyn, PA. 19312. High school rugby boys and girls that are interested in playing college rugby and college coaches who are interested in meeting the next generation of student athletes. This is a great opportunity for you to meet top area university and college coaches from all over the east coast and to show off your rugby skills and who you are as a player and person. A positive attitude and your rugby resume. Please also bring your GPA, SAT and ACT scores, years of experience and information on the teams you have played for during your career including honors and coaches references. What is the cost and how do I signup? The cost is $100 (note there is an additional processing fee of: 3.15% + $1.15 per transaction) and you can register and pay by clicking here. The annual year end rugby banquet will be held on Thursday, May 24, 2018 from 5:45 – 10:00 pm at the Waynesborough Country Club (440 Darby Paoli Road, Paoli). Price $40 per person (senior players are FREE). Players must dress appropriately for an awards ceremony. Boys are encouraged to wear shirt and tie (no denim). Print out, fill out, and send in the Conestoga Banquet Registration form below with check.